I was supposed to producing pizzas for our cell-group’s film evening. After cycling round three supermarkets and discovering there was apparently some sort of national shortage of ready-made pizza bases, I gave up and bought the flour to make them instead. Handily printed on the side of the flour packet I found recipes for bread and pizza bases, thus saving me from having to trawl the internet to find out. 1. Put the ingredients into a bowl, apart from the water. While I’m touched by the efforts to which Pureza have gone to ensure that my pizza turns out perfectly, I rather suspect that anyone who needs to be told how to mix hot water with cold water in order to make warm water, probably shouldn’t be allowed in the kitchen unsupervised. For the record, a kilo of Pureza flour makes six round pizzas and they all tasted fantastic. A not very News-worthy Roundup of the last ten days, which we aren’t exactly sure where they disappeared to. Oh look, I’ve figured out how to do strikethrough text in HTML. The thing about writing our own software is that we don’t have handy buttons to do these things automatically, coupled with the fact that I’m a natural technophobe so please at least act like you’re a little bit impressed. Our friend Sergio came out of prison, and we went to see him give his testimony at a church in Cordoba, along with his family, friends and even a Christian prison officer. He was initially homeless, so we invited him to stay with us, which wasn’t ideal as he is doing a course in Cordoba, as well as wanting to be closer to his kids. However, someone has now lent him a house to look after which is only a couple of kms outside Cordoba, and he is very happy with it; Martin is meeting him for lunch today. I took a women’s meeting at short notice. We did a little Bible study about Lois (grandmother of Timothy, see 2 Tim 1:3-6 and 3:14-15) and I told them that grandmothers are the future, which I think they liked. I also led our home group last week, which was going quite well until someone started talking about the demon in her bathroom, and the lady next to me started whispering “don’t worry, she’s mad”. We made 48 empanadas to share afterwards; empanadas are like meat pasties only smaller, so you have to calculate 5 or 6 per person. I’m also in charge of writing the next study; still ploughing our way through Mark, I’m in chapter 5 for this week. Martin went to the prison in San Francisco on Saturday with our friend Miguel, which they were both pleased about, and we all went back to Miguel’s village of Porteña afterwards for coffee and cake with Miguel and Mrs Miguel. They are really solid “salt of the earth” folk, I always like to see them. I spent an increasingly bad tempered day-and-a-half trying to sort out Martin’s insurance claim for his knee operation from last September. After all, if you are an insurance company purporting to deal with people living and working abroad, it would naturally make perfect sense for you to operate an email system which dumps attachments into a black hole, thus preventing anyone from sending you their claim forms. Doh! We finally solved it by Martin putting the whole thing onto a web-page and sending them the link to download it themselves. However, once they actually had the file, they turned it round in 48 hours which we can’t really complain about. The claims people were probably so surprised that a form had made it through their torturous communication department that they dealt with it by return as a mark of respect to a superior technical intellect. Or something. We are making progress on the poo saga. After having to empty the black hole (not the same one where the insurance company’s emails go to… or maybe…) for the third time, we pleaded with the landlord, who agreed that we need to be connected to the mains sewage. So she sent a couple of goons around to measure up. Apparently their measurements are then sent to the municipality for project-planning permission. Time estimates for this to be given range from “a couple of weeks” to “a long time” so in the meantime, permission for pooing will be granted in exceptional circumstances. 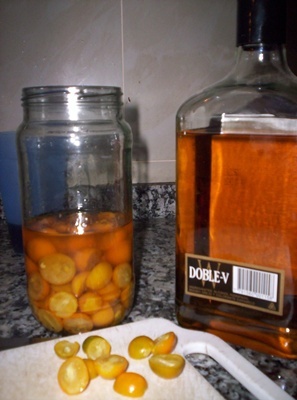 These are our own home-grown kumquats being pickled in whisky: obviously next year’s project will be to distil the whisky as well. We also had our own spinach in the pasta sauce yesterday, and my parsley and oregano are coming on a treat. I have finished all my immigration paper work. I never have to do any of that again. Yesterday we left home at six in the morning to drive to Cordoba. We spent three hours queuing in immigration, and another three hours queuing in the civil registry. Joni became fed up with the whole thing at about the twenty minute mark, and most of the rest of Cordoba became fed up with us fairly soon afterwards, that is apart from the folk who appreciated it as a welcome diversion that he was smearing a green lollypop all over the chairs in the waiting room and occasionally over the legs of some of the people sitting on same. Martin still has one trip left to the civil registry, but by popular agreement he is going on his own next time. Apart from the high-pitched screaming, and spreading green lollypop across the world, Joni spent some time learning how to take his own clothes off; so I realised when I looked round and saw he was down to his nappy. We arrived home some fourteen hours after we had left, about two and a half minutes before our bible study group descended for their weekly meeting. Luckily I managed to chop the onions and tomatoes to go on the pizzas in the small talk bit before the meeting happened, while simultaneously bathing Joni (green lollypop in hair). Today our kitchen flooded, which we thought was the washing machine until we realised that the water was coming up through a drain cover in the floor. So Martin went to look for a plumber, who came and informed us that we didn’t need a plumber, we needed to empty our septic tank yet again. I tried to ask him why it had filled up so quickly, and the explanation was something to do with “napas” coming down from above. Which was either something spiritual or something in plumber speak but either way I wasn’t getting it, so we called the sucky hose people to empty the black hole again. The sucky hose people said, “it’s your washing machine, you should try to tip the water out somewhere else”. Hmm yes, like over the neighbour’s wall or where? Which still didn’t explain why the tank had taken six months to fill up the first time and two weeks the second time. We really haven’t done that much extra washing, even counting the green lolly incident. In the afternoon I took the lid off the black hole, and was slightly disconcerted to see the water levels already rising. So we called on our neighbour, Sergio, who is also a builder and plumber. He tried to explain the “napas” which as far as we can make out is something to do with the water table, and it depends on the level of humidity and whether it’s a north wind or not. So I think that means I was right in the first place… “something spiritual in plumber speak”. We have managed to artificially create an income discrepancy – our lab was populated by a single statum of the beekeeping class before we brought fair trade principles in, but now our lab contains one class of rich Fair-Trade-branded beekeepers whose livings are subsidised by rich people assuaging their conscience with expensive brands, and an another class of poor beekeepers untouched by the “benefits” of Fair Trade on the same income as before. So Fair Trade widens the gap between rich and poor – actually it creates one – which is a bad start. A rising tide does not float all boats. Now comes the funny part. If we extend Fair Trade subsidies to the majority of beekeepers in our lab, then the situation is even worse. Now most people can afford to pay more money for goods and services as income is higher, inflation happens and prices go up, but a minority of people, the newly-poor beekeepers, still have the same income and can buy less food then they could previously. Bringing Fair Trade into our lab means that some of our beekeepers now have a worse life than they did before, whereas those we have helped are getting more in but are spending more to get the same life as they did before. Oops. There then ensued a 32-comment discussion, and I think the referee would probably agree that I lost. And it’s taken me all day today to think about why I couldn’t just move on from that. It has been an interesting exercise, if somewhat navel gazing. For which I apologise a bit but I’m still going to write about it. So if you don’t want to see my navel, it is OK to stop reading now. The first thing that didn’t do my head in was the niggly stuff. Like when I was accused of “appealing to emotion”, by the same person freely using phrases like “rich people assuaging their conscience”. That’s annoying, but it’s not the main point, and it doesn’t do my head in, things like that happen in arguments. We’re human beings. The secondly thing that didn’t do my head in is that the theory was plain wrong. It assumes that “beekeepers” are in some little sub-society a very long way away from anyone else. Whereas in our little corner of the world here at least, the “beekeepers” work in organisations which also employ supervisors, team leaders, foremen, etc. And the whole organisation itself exists within a town community of lawyers, doctors, businessmen, the butchers the bakers and the candlestickmakers. Within that context, the beekeepers are nearly at the bottom of the pile. So introducing fair-trade, or in our own context, equivalent initiatives, doesn’t push prices up, because that’s already been done by the lawyers, the judges, the politicians and the business managers (who around these parts are mostly in bed with each other, spawning questions such as “where did the government’s money go?” and “who ate all the pies?” but that’s a whole other story). And it doesn’t make the fair-trade (local equivalent) beekeepers rich because they are still essentially primary producers and if the gap between the cost of their honey verses the honey down the road gets too big, even do-gooding bleeding heart liberal types like me will eventually stop buying it. What we see round here at least is that the outcome of co-operative ventures is to boost the member beekeepers into positions of participation and choice-making, like choosing to work eight hours rather than twelve, or choosing to enable ones off-spring to continue studying, or for the beekeepers themselves to complete their schooling at night school, or in two cases that I know of here, for the profits to be ploughed into other things; in one case community projects, and in the other case, into supporting Argentinean missionaries overseas. However, we digress… although it caused me to expend probably too much emotion that the theory was defended to the death as though it were a globally generalisable fact without ever giving one concrete example where the theory had been shown to function, that in itself isn’t what did my head in. Having wrong hypotheses, and defending them, are still basic human rights and necessary for scientific progress. The third thing that didn’t do my head in, but probably should have done, is that it is patronising. The underlying conclusion is that it would be better to leave people in poverty than to support an initiative that might later be shown to have unequal outcomes. Why is that patronising? It is one of a raft of rather too many models which are proposed for “other” people a long way away, particularly in “developing” majority world contexts, but nobody would seriously advocate as a great idea for Liverpool or Bradford, let alone Oxford or Tunbridge Wells. However, there are already plenty of patronising theories floating around here, one more of those doesn’t do my head in. No no, the thing that actually did my head in, I realised as I cycled back from the supermarket today, is much more selfish and close to home than that. It is the frustration of being out-articulated. That for me is an almost unknown occurrence. I lose arguments all the time (ask my husband! ), I lose arguments because I am wrong, because the other person knows more, because I walk away, because the other person shouts louder, because we all degenerate into childish sillinesses and for a zillion other reasons, but never because the other person is more articulate than I am. In fact, it’s usually the other way around. It has been an interesting exercise today reflecting that winning an argument by being right is not always directly correlational to winning an argument by being articulate, and thinking about times when I too may have gained an advantage simply by being more gifted with words than my sparring partner. It’s not been a comfortable process to think through, but it’s probably been good for me to do it. So to you, who have unintentionally led me here, I say “thank you and no hard feelings”. There is something smug making about the sight of newly-jarred marmalade cooling on the worktop, and the smell of home-made pies baking in the oven. 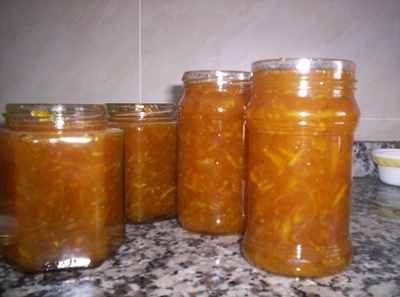 I don’t even like marmalade, but I enjoyed the whole faffy process of peeling and chopping and grating that is involved with preparing the oranges, and I love the witches cauldron sensation of stirring a big pot of bubbling gloop. I made some plum jam a couple of weeks ago, which I do like. Plums were on offer, so I bought quite a lot, along with the sugar to make jam, and I dumped it all in a heap on the work-top, and I thought, “I dunno, that looks a bit much to me”. And then I thought, “that’s because if I was making this in England I would have been thinking in pounds not kilos”. Doh. So then I divided it all in half which looked more like normal. Then I learned that my largest pan isn’t really big enough to make jam. And as a result of that piece of learning, I also learned that jam that has boiled over and caramalised onto the cooker takes a jolly lot of scrubbing to clean off. Last night I made three pies to feed our bible study group after the meeting (evening meal happens late in Argentina, people go out first and eat when they get home afterwards, so we normally just invite them to stay on when the study ends). We know that at least one family survived to tell the tale because they invited us to an asado (BBQ) for lunch today (it’s the may-day bank holiday). And today I also made a pineapple upside-down cake, and a board-book of transport pictures for Joni. So now I’m officially smug, at least for the next three minutes, when I shall be forced to relent and tackle the fallout from bath-time.